Kevin Paredes/Photography Editor Agnes, played by Margaret Leisenheimer, a junior majoring in theatre, in a scene from “Castle on the Hill.” The show, which opens on April 27, is written and directed by Elizabeth Mozer, an assistant professor of theatre at BU. “Castle on the Hill,” the last Mainstage play of the semester, addresses the history of mental health treatment through the lens of a chapter of the Binghamton area’s history. The Binghamton State Hospital, which opened its doors in 1864 at 125 Robinson St., was the nation’s first institution constructed to treat alcoholism as a mental disorder. The playwright and director of the show, Elizabeth Mozer, an assistant professor of theatre at BU, adapted the play from her one-woman show, “The Asylum Project,” which is set at this historic site. “Castle on the Hill” revolves around the lives of Agnes and Lina, two women who are faced with confronting their inner demons at the asylum. Set in two different time periods, the audience sees the ways in which these characters’ respective eras affect how they unpack their issues — but even more conspicuously, the things the women have in common. 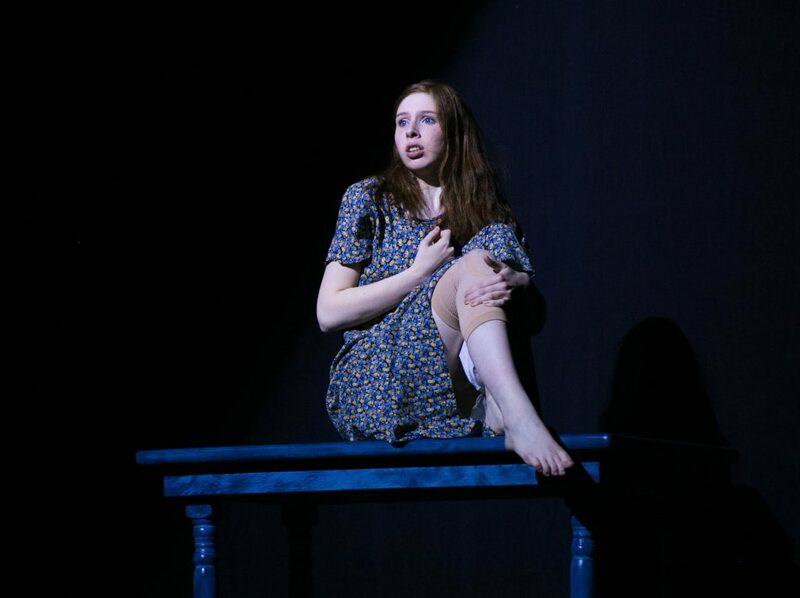 Agnes, played by Margaret Leisenheimer, a junior majoring in theatre, is a Polish immigrant living in the 1920s who becomes a patient at the asylum. Lina, played by Christine Skorupa, a sophomore majoring in theatre, is a woman undergoing psychotherapy treatment in the city of Binghamton in the 1970s and is grappling with the death her mother, whom she never met. While the main plot follows Agnes and Lina, a part of the show’s narrative is composed of a series of shorter, individual stories that contextualize different patients’ paths to the Binghamton State Hospital. From “The Asylum Project,” this new play has been adapted so a cast of 12 actors play a total of 22 characters portrayed on stage, including anonymous patients, a nurse, an attendant, family members of the patients, a transgender man, a sexual assault survivor and a deaf woman. Throughout the rehearsal process, the actors conducted their own extensive research to better understand the experiences of those struggling with mental illness, as well as topics like World War I and immigration in the United States. By shedding light on mental illness and portraying a roster of characters based on real patients, Mozer said said she hopes to highlight past and present perceptions people hold over those deemed unfit to function in society. “Castle on the Hill” runs in Watters Theater in the Anderson Center on April 27, 28 and May 4 at 8 p.m., with matinee performances on April 29 and May 6 at 2 p.m. On April 29 and May 4, there will be postshow talkbacks with the audience, Mozer and the cast. Tickets are $18 for general admission, $16 for alumni, faculty, staff and seniors and $10 for students. Discounted student tickets are available for $5 at the Anderson Center Box Office for the Friday, April 27 performance.